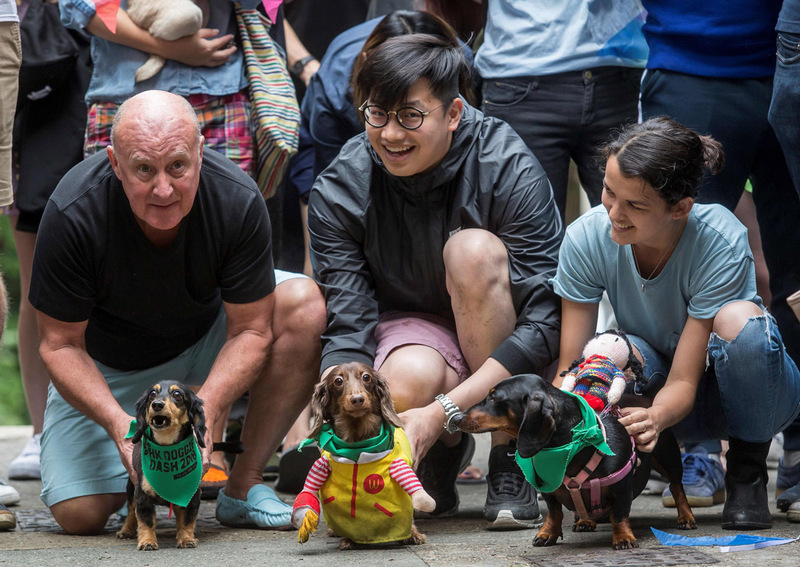 Dozens of pugs and dachshunds, compensating for their lack of speed with dogged determination, took part in Hong Kong's inaugural "doggie dash" on Sunday to raise funds for abandoned and rescued canines. Dog-lovers packed a leafy and quiet area in the Sheung Wan neighbourhood, eager to document their pooches' moments of triumph with smartphones and selfie sticks. While the laneless race track proved a little confusing for some pets, others happily scampered across the finishing line into the hands of their owners. "There are lots and lots of dogs that are abandoned each year in Hong Kong," said Marilyn Ho, an organizer of the event. "We need to educate the Hong Kong public that dogs are not just commodities and possessions, that they are living beings who have feelings." "They need a home forever and to be well looked after, like you would treat your own children." The Society for the Prevention of Cruelty to Animals says thousands of stray dogs and cats are caught annually in the city. While hundreds find new homes through animal welfare organisations, the majority are put down. Sunday's racers competed in looks as well as speed, showing off attire ranging from Superman costumes to colorful accessories. Race entry fees of HK$130 ($16.5) per dog will be donated to a local dog rescue society.